I read Shepherding a Child's Heart years ago, back when I was pregnant and didn't have anyone to practice on. Parenting responsibilities back then meant only that I should try to eat healthy and walk at least a mile every day. I didn't realize how very easy that was at the time, comparatively speaking. 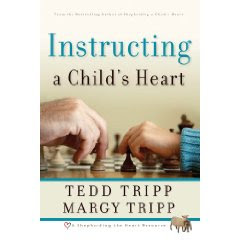 Now parenting means a little bit more to me so I was glad to get a bit of a refresher course by reading the next book by Tedd & Margy Tripp, Instructing a Child's Heart . Suddenly it smacks of practicality! Imagine that! The basic concept of this book is that we are to teach our children how to view the world so that they can become confident, God-honoring adults. The Tripps focus on the heart of the child being molded and cared for in such a way as to produce confident children who know the difference between right and wrong. This is a very solid parenting book any which way you look at it. I have to say though that I focused less on "what I need to do for my kids" and more on their introductory chapters on parenting with purpose. I focused on what I need to be doing and not on what my son should figure out how to do by now, thanks! Parenting with purpose (my words, not theirs) means acknowledging that I didn't have children just so that I could own and operate my own daycare. Some amount of parenting must be accomplished as I raise my son. How do I parent? (Well that's an invasive question to ask a person, dontcha think!?) To be honest, some days I'm sure I qualify for Super Mom of the Year and other days I could seriously use some help! What I WANT to be doing, especially after reading this book, is to be modeling the behavior that I desire in my son. In short, I must practice what I preach or else the point will be entirely lost. Two year old logic might not amount to much but he can certainly see when I'm being hypocritical. The very best form of instruction is to lead by example. Do I need to be perfect in order to parent? No. But do I need to strive for excellence in my own Christian walk before making demands of my kids? Oh, absolutely! Without a doubt. For me this book was a good reminder that I need to align myself with the Bible before I ask anyone else to. The Tripps were very encouraging in motivating the parent to set goals. What is my personal aim? : Model the Word, speak the word, love the child. They constantly reference scripture as they exhort parents to be wise in instructing their children's hearts, not just making demands upon the outward apperance and behavior. They understand that what is inside of a child is what will come out and they inspire the reading parent to invest good things in their child's heart for a positive outcome. Again, this is a solid book and a worthy read. I recommend it to anyone who needs a parenting tune-up. It's worth your time! I'm reading Shepherding a Child's Heart for a second time right now. This book sounds wonderful. Those are some of the same things that I want to be and do for my children. Thank you for the great recommendation. Sounds like a very good book for parents. My children are all grown and out of the house. I read lots of Charles Dobson that was helpful. Shepherding a Child's Heart really helped me through a rough season (actually, I think I need to revisit it, too). Thanks for highlighting this, CArrie--I'd never heard of it! That sounds like a great book. I'll have to add it to my Wishlist. Thank you so much for the book recommendation! I have not read "Shepherding a Child's Heart", but my SIL gives it rave reviews too, so I def. want to get it to read, and now I am excited to read this book as well! Thank you for visiting my blog and for the sweet comment! What a great book review. This book sounds truly excellent, and I will definitely need to get it! Thanks for stopping by my blog today. To answer your question, I did take the Twitter plunge as a result of the UBP. I just started blogging recently, and it seems that these days blogging and Twittering kind of go together. So I took the plunge and I am still trying to figure it out! I read Shepherding a Child's Heart about a year or so ago, but now my husband is a new Christian and we're reading it together. I'm so excited for us to be on the same page as parents and can't wait to read Instructing a Child's Heart.